Every year we ask our members what they regard as an outstanding Pub within the branch area. A list is then subsequently compiled and members asked to vote on the best three from this list. These Pubs are then visited and the final votes cast. Our members have completed judging the final candidates for our Branch Pub of the Year 2018 and the results were announced at the the Twickenham Beer & Cider Festival. 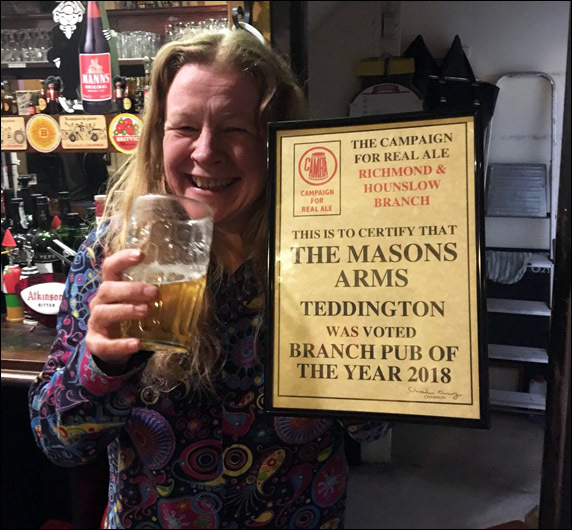 The winner was the Masons Arms in Teddington. Congratulations to Rae Williams and her staff! Picture taken by Fiona Batey. The Roebuck (Hampton Hill) & Express Tavern were joint third. The runner up was the Sussex Arms in Twickenham. This year's pub of the year was announced on the 20th Oct 2017 at the Twickenham Beer & Cider Festival. The winner was the Roebuck, Richmond Hill. 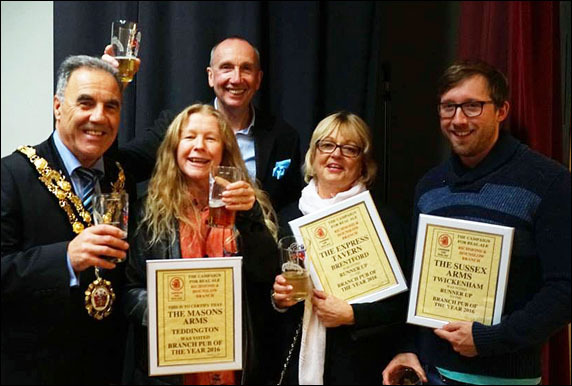 Joint runners up were the Sussex Arms & Express Tavern, with a special mention to the Masons Arms - Runner up in London pub of the year. Our members have completed judging the 3 candidates listed below for our Branch Pub of the Year 2016. 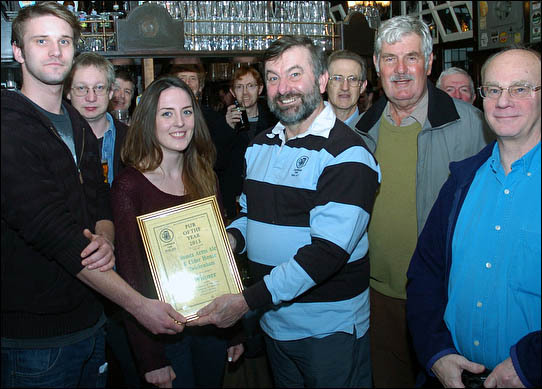 Last year's the winner was The Mason's Arms again, which was announced at the the Twickenham Beer & Cider Festival. Congratulations to Rae Williams and her staff! The Express Tavern and Sussex Arms were joint runners-up. The Masons Arms in Teddington - Winner! Sussex Arms in Twickenham - Runner-up. 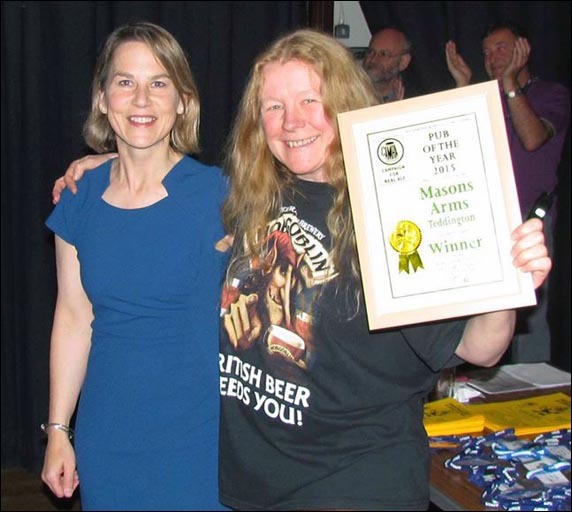 The award was presented at the Festival by Twickenham MP Tania Mathias with Charles Owens the Richmond & Hounslow branch Chairman. Congratulations to Rae Williams and her staff. 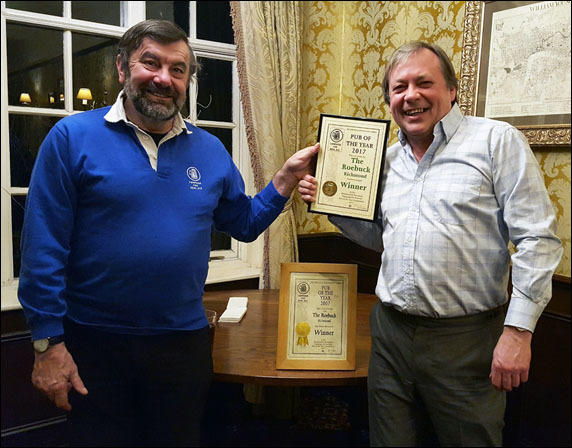 Photo: Mick Laker and Paula accepts the Branch Pub of The Year certificate on behalf of the Rifleman from Charles Owens - CAMRA Branch Chairman - at the pub on 17th December 2014. From left to right: Colette, Fiona, Dan, Paula, Mike & Charles. Branch members have spent the last few months visiting and re-visiting all our key pubs and have marked each one according to strich CAMRA criteria. This year when all votes were added up there was for the second year running an unequivocal winner. The Sussex Arms Ale and Cider House at 15 Staines Rd, Twickenham [GBG 2014 page 314]. The runner-up was the Rifleman, 7 Fourth Cross Rd, Twickenham, TW2 5EL [GBG 2014 page 314]. The presentation took place on Thursday 17th in the Clarendon Hall at YORK HOUSE Richmond Road, Twickenham. 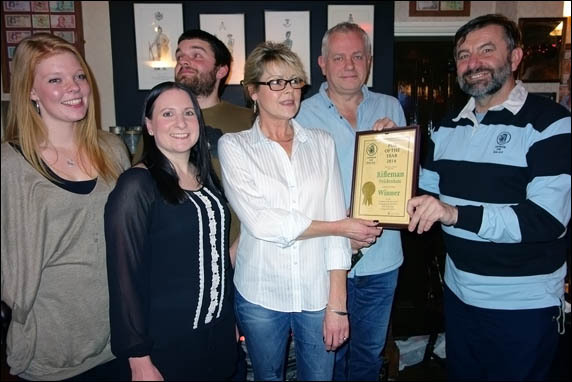 Photo by Paul Leonard: The official presentation of the Richmond & Hounslow Branch Pub of the Year award for 2013 took place at the Sussex Arms in Twickenham on the 9th Jan 2014. 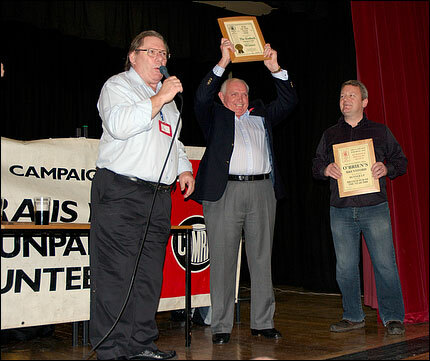 The picture shows Fin Gloyn and Alex McKenna receiving the award from Charles Owens the Branch Chairman. 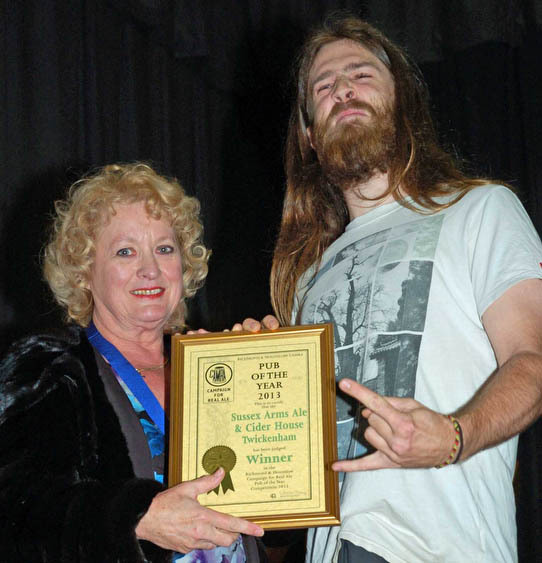 Photo: Councillor Clare Head presents the certificate to Andy Barlow's represenative from the Sussex Arms at the Twickenham Beer & Cider Festival. 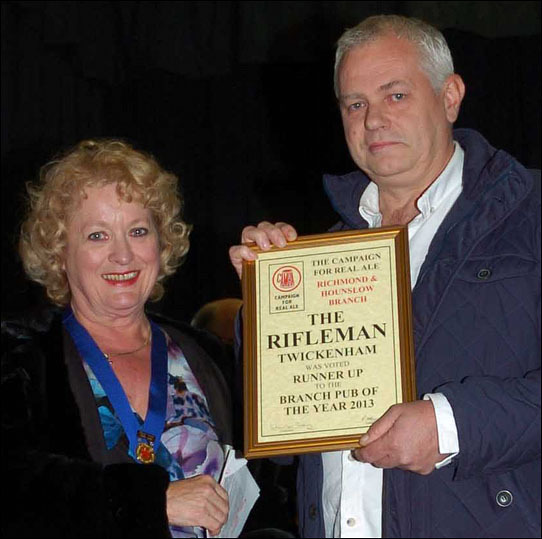 Photo: Councillor Clare Head presents the runner-up certificate to Mick Laker from the Rifleman at the Twickenham Beer & Cider Festival. Peter Brew and Ashley Zobell at the Twickenham Beer & Cider Festival. And after the scores were assesed the winner was The Prince of Wales. 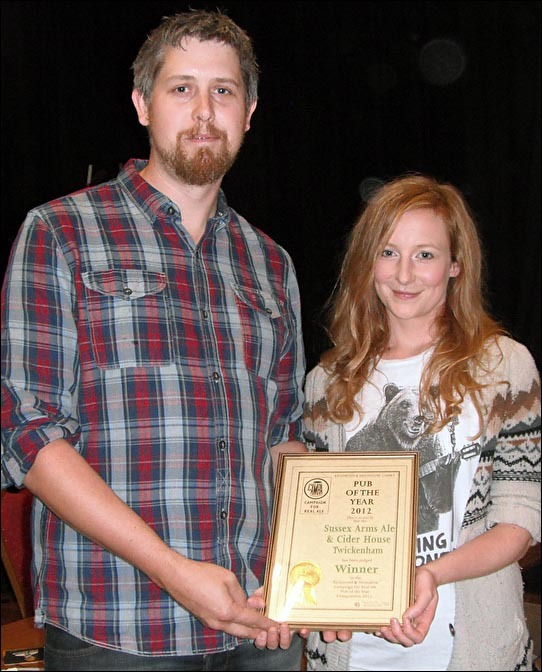 The presentation night was on Thursday 27th at the 11th Twickenham Beer & Cider Festival. 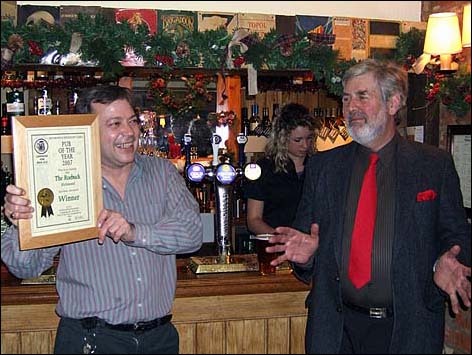 Photo: Brian Kirton presents the certificate to Gavin Norman (left) in the pub. And the winner for the second year running is The Red Lion. 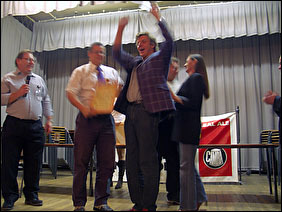 The presentation night was on Friday 14th Jan 2011. Photo: Brian Kirton with Roy Hurry presents the certificate to Paul Andrews and Louisa. 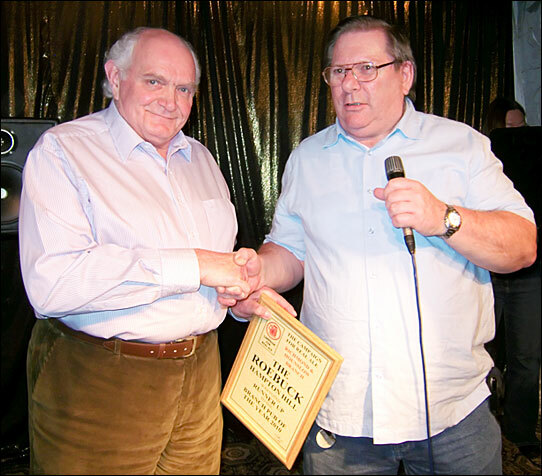 Photo below: Brian Kirton presents the Runner-up certificate to Terry Himpfen. And the winner is! The Red Lion. 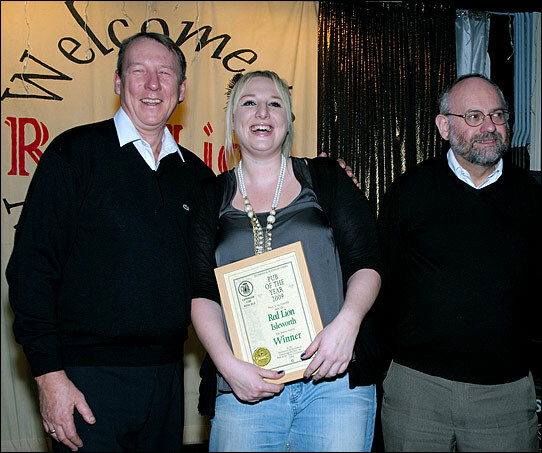 Photo: Andy Pirson presents the certificate to Paul Andrews and Louisa on Mon 14th Dec '09. 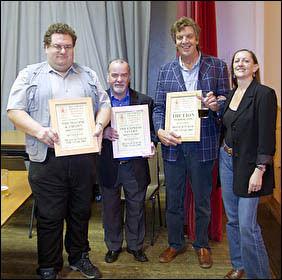 Pub of the Year Presentation at the Twickenham Beer & Cider Festival - 23rd Oct.
Brian Kirton - CAMRA Branch Chairman - presents the Certificates to Terry Himpfen of The Roebuck, Hampton Hill (winner) and Derek O’Brien O’Brien’s, Brentford (runner-up). 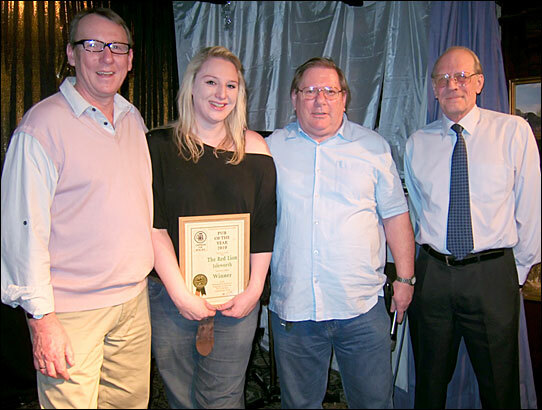 Pub of the Year Presentation at the Roebuck, Richmond Hill on 14th Dec.
From left to right: Dereck O'Brien (O'Brien), Paul Weymouth, Marie Sullivan, (Roebuck) and George Middlemiss (Prince of Wales). 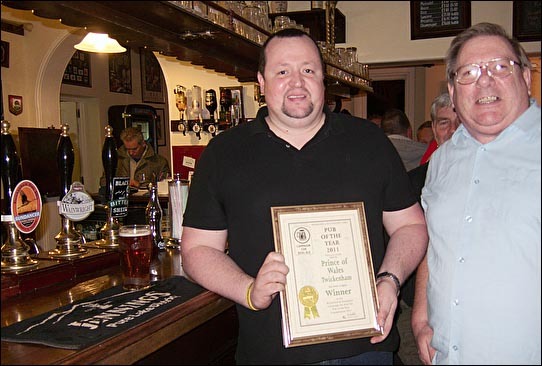 Our Pub of The Year 2007 declared on Thursday evening at the Beer Festival is the Roebuck, 130 Richmond Hill, Richmond. 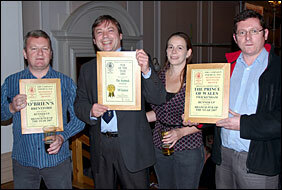 The two runners-up were The Prince of Wales, 136 Hampton Rd, Twickenham and O'Brien's, 11 London Rd, Brentford. 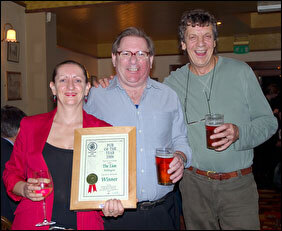 The winner for the second year running was the Lion, Teddington. Congratulations! to Don and Myfanwy and all their staff. The two runners-up were The Express, Kew Bridge and Coach & Horses, 27 Barnes High St.
Picture taken on 17th November in the pub. The winner was The Lion, 27 Wick Road, Teddington. The official presentation took place in the Pub during November. 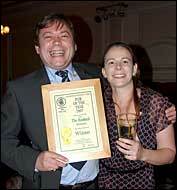 Our Pub of The Year 2005 declared on Thursday evening at the Beer Festival is the Lion, Wick Road, Teddington. The two runners-up were The Express, Kew Bridge and Magpie & Crown, Brentford.